Samsung Galaxy Smartphones with Notch, Arriving Soon? Samsung has made fun of and thrown shade at Apple and Google for releasing handsets with an awkward notch -- but if were to believe recent rumors about future Galaxy smartphones, it seems that the Korean Giant could very well go that route too. 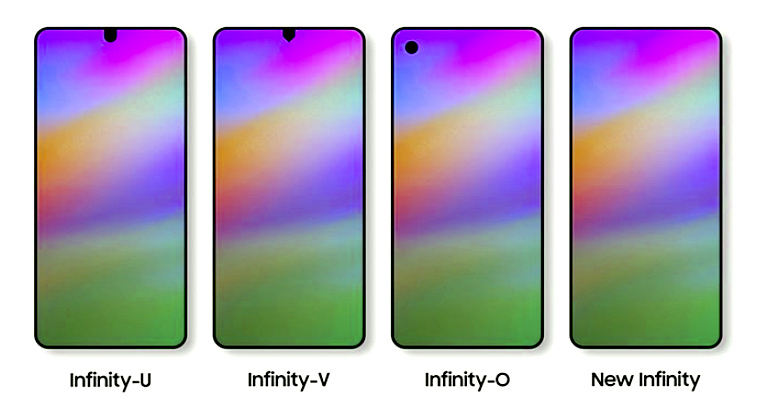 According to insiders, in 2019, Samsung will be using four new Infinity Display types or configurations on its full-touchscreen phones - shown in the image below - and two of which will feature a notch that has almost the same size and placement as what we see on current OPPO and Vivo smartphones. There's the Infinity-U display with U representing the shape of the notch housing the front-facing camera. Rumors have it that this will debut within a few weeks from now through at least one new Galaxy A model, which will be announced in China. The Infinity-V notch, on the other hand, looks more like a shortened tip of a pencil than anything. As yet, we haven't seen any Android smartphone with a notch that looks as 'structured' - replete with clean lines and corners - this one. Off hand, I believe 2019 Galaxy J models will be the first to get this kind of screen. Concept photos and leaked information about the Samsung Galaxy S10 and S10+ have hinted that these 2019 flagship smartphones will have the all-new Infinity-O display with a 'floating' mole-like notch located at the upper left part of the screen. And finally, we have the rumored New Infinity screen with no notch whatsoever. My hunch is that this will be used on future Galaxy Note releases and even on the much-awaited Foldable smartphones by the Korean company. But that's just my guess and your guess is as good as mine. I have a feeling that when Samsung finally announces these new Infinity Displays, they'll avoid mentioning the word 'notch' or maybe they'll say that at least their notch is not as big or wide as Apple or Google's. But hey, a notch is a notch regardless of size, right?